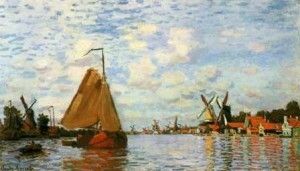 In 1871, Claude Monet, along with his family, spent four months in Zaandam, a town near Amsterdam. Zaandam was a city in the province of North Holland, located on the Zaan, near the North Sea Canal. Zaandam was a city of canals and shipyards and had once served as a large milling center, home to thousands of windmills which powered saws, some of these mills still stood during Monet’s time. Monet was trying to steer clear of the Franco-Prussian War so he had left Paris and moved to London. 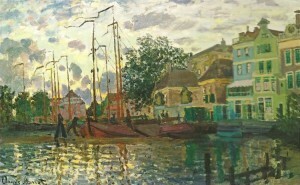 It was during this excursion that Monet was in Zaandam. 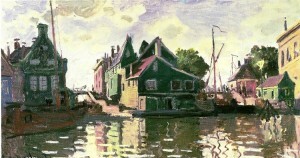 During their stay in Zaandam, Monet created some 25 paintings of the area. 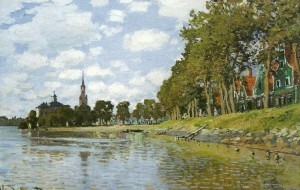 The time painting in Zaandam turned out to be important in Monet’s development as an artist. His paintings at this time were shocking to the public. They exhibited a different way of looking at nature. 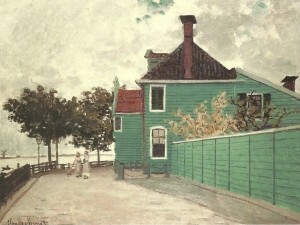 Monet’s Garden House on the Zaan, Zaandam, for example, contains all of the characteristics which distinguished Impressionist paintings including integrating people into a landscape. The women with their beautiful dresses and parasols mark the painting with elegance. 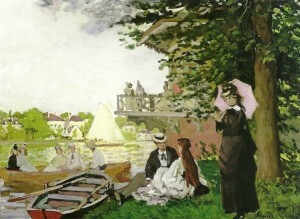 He gave of glimpse into a summer afternoon of a leisured-life, in open-air. The paintings Monet created while in Zaandam were some of those building anticipation of what would become classic Impressionism’s peak in 1874 with the first Impressionist Exhibition in Paris. Monet’s works of the area left their impact. 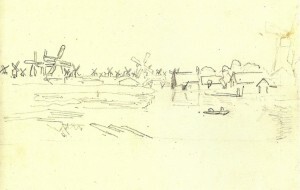 A foundation has been created to recognize the works he painted while visiting Zaandam. The Blue House from Monet’s painting has been repainted to match the original blue Monet painted.